It's shameless, I know, but I have a new shed I want to build for some proper studio space, so I'm selling my soul, I mean, I selling my CD's. As per the last blog post, I was up in Sydney for the Aus7 ExpO, and spent the whole day presenting my gum tree clinic over and over through out the day. 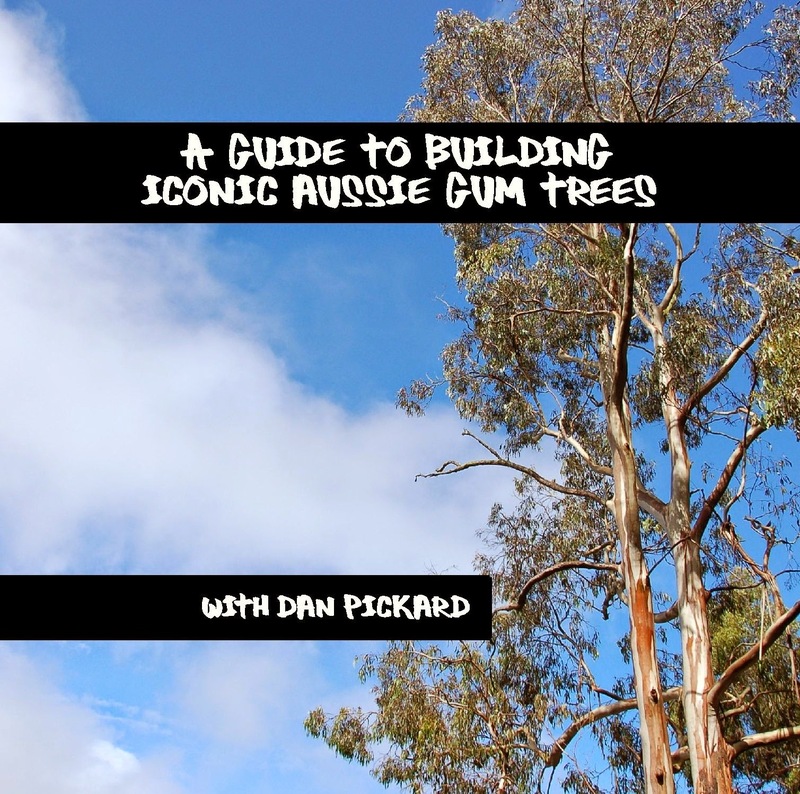 As part of preparing for that event, I spent some time rewriting my previous gum tree building clinic notes. They were reformatted so they appear better on a computer monitor (ie landscape view), and with a heap of extra information pages, such as some colour charts and additional instructional pointers. The clinics I hosted up in Sydney were accompanied by a slide show presentation to help speed up the steps in the shortened clinic format. A reduced clinic time would mean less time to spend explaining my process, so I produced a pile of CD's with my clinic notes. What I presented during the clinics was a brief overview of what I do, and if people wanted to know more, the information was available to purchase on the CD. Thankfully, plenty of people wanted that extra information. I intend to have my CD's available on my stand when I display at the couple of model railway exhibitions I attend across the course of the year (my next outing is up at Stawell in July). For those that aren't able to get to these exhibitions, I am making the CD available through eBay, at a price of $10, plus postage (in Australia, $3 postage, or $7 to the rest of the world). I picked up the CD from the Post Box today and opened up as soon as I got home, after several hours of looking at the photo files, I had to clean my computer keypad as it was covered with drool, I moved on to the tutorial which I have to say is fantastic, the amount of information on paints etc you have supplied is brilliant. I will re-read this several times in the future I'm sure. Well done, best couple of dollars I have spent in a long while. Thanks Tony. Glad you found the CD entertaining and educational. Took a while to think about how to stop and put the process into words, when I normally don't think too much about the steps I go through in modelling these trees (built that many now!). Wow, Dan. These trees look fantastic! I will be sure to pass your website on to my a few bods I know who model Australian layouts. Thanks for sharing. CD looks great. Have you considered attending the Modeling the railways of SA convention and selling your CDs there? It is held in late Oct early November every year. Perhaps Les could sell them out of the box for you? I do know about that convention, and have a few mates that travel over for it most years. Sometimes tricky for me to manage interstate events between work commitments, with the added two days of travel before and after. If I was to sell the CD's at a convention, its normally part of a clinic display. I'll keep it in mind for next year perhaps.